Connor Bennardo finds a way to get things done offensively. For an attackman, there’s nothing more important. Bennardo, a natural righty, is also a strong dodger with both hands, allowing him to draw slides and feed teammates. It’s those variety of abilities that have made him a Division I player. 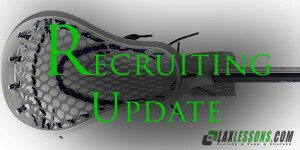 Earlier this week, he Bennardo committed to the University of Detroit-Mercy, a verbal first reported by Joe Lombardi on LaxLessons.com’s Lacrosse Insider premium coverage section. The 5-foot-10, 175-pound Bennardo is also an outstanding athlete, who is a two-way starter at running back and linebacker in football who also returns kick and punts. He’s played football since first grade. The main factor in my decision to commit to UDM was the school’s obvious commitment to excellence in both academics and lacrosse. As soon as I stepped on campus, (Detroit Mercy Head) Coach (Matt) Holtz made the place feel like home. I fit in well with the team and staff and ultimately knew that UDM would be a great fit for me. I’m very excited to become a part of such an up and coming program. Throughout the process, I also considered Monmouth, Vermont, St. Joseph’s and Drexel. I’m a good inside finisher, but I will take the assist over the goal any day. I will continue to strive to improve upon all aspects of my game. But more specifically, I want to improve my outside shooting ability. I will also keep working hard in the weight room, both before and throughout my career at UDM, because there’s always an opportunity to get stronger and faster. My father, who along with my mom is the biggest inspiration in my life both on the field and off, was a former high school lacrosse coach so I’ve had a stick in my hand since before I could walk. I play for the Long Island Outlaws. This summer, I participated in the Under Armour Shootout, Peak 200 Invitational Camp, UPlax, and several other local tournaments. First off I’d like to thank God for blessing me with such an amazing opportunity, as well as Coach Holtz and the whole UDM staff for allowing me to become a Titan. Thank you to all the coaches and teammates I’ve had over the years, especially Coach (Justin) Arini from the Outlaws and Coach (Bryan) Proctor from my school for being there throughout my entire development as a player and shaping me into the player and person I am today. I want to thank my whole family, especially my parents, who are my biggest supporters and role models. And lastly, I want to give a special thank you to my sisters for always having my back and pushing me to be the best athlete and person I can. I don’t know where I’d be with out you guys.